In his journal, Modern Nature, the film maker, Derek Jarman,wrote about his time at public school. ‘Smarting under this tortured system, the boys tortured each other, imposed valueless rules and codes of conduct, obeyed imaginary hierarchies where accidents of origin and defects of nature were magnified.’ … The very name ‘public’ school carries with it the stench of hypocrisy. Another robbery, this one linguistic. These schools are as far away from the public and their norms and needs as you can get. Yet secession from the life of the rest of the nation is no barrier to the desire to dominate it. This is something I understood and despised from an early age. And wanted no part in it … ‘Wilson, you’re not kneeling in chapel.’ ‘I don’t believe in God, sir.’ 'That has nothing to do with it.' ‘Do you believe in God, sir?’ 'We are not talking about God here, Wilson. We are talking about loyalty.’ The last straw (no pun intended) was when I confronted the school chaplain, when he read Matthew 19:24: ‘And I tell you, it is easier for a camel to walk through the eye of a needle than for a rich man to enter the gates of heaven.’ ‘Isn’t that socialism, sir?’ ‘This parable is not to be taken literally, Wilson. Sit at the back of the class and get on with your Latin.’ There I remained, banned from Religious Studies, but I got a good grade in Latin. I also got a good grade in History. I couldn’t stand the present so I concentrated on the past. Here's a clip from Lindsay Anderson's 'If'. I love this because it is dubbed into Italian! 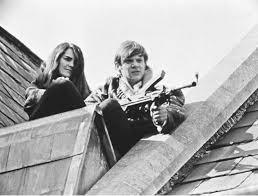 I am with Malcolm McDowell .. in spirit only, of course, and without the weapons. If you want to know the name of the school, the clue is in the first paragraph. But why not buy 'Left Field' and read more.